For some, connections between geeks and refugees aren’t intuitive. There’s no one-size-fits-all approach to refugee resettlement, but approaching the 45 year anniversary of Lao in the US in 2020, the role of Midwestern geeks deserves a closer look as we make recommendations for future refugees. Over the years, I’ve fielded more than a few questions asking if my personal success isn’t simply an irreproducible exception. But as I consider the journeys of many of my fellow Southeast Asian refugee artists, including Saymoukda Duangphouxay Vongsay—who created the successful play Kung Fu Zombies vs. Cannibals—or the verse of Bao Phi, May Lee Yang, and Jenna Le, or filmmakers Carol Rasaphangthong, Peter Chanthanakone, Burlee and Abel Vang, Sydney Viengluang, and the recently Oscar-nominated Mattie Do, I think we can legitimately ask how geekdom has expanded our opportunities in rebuilding our cultural traditions. 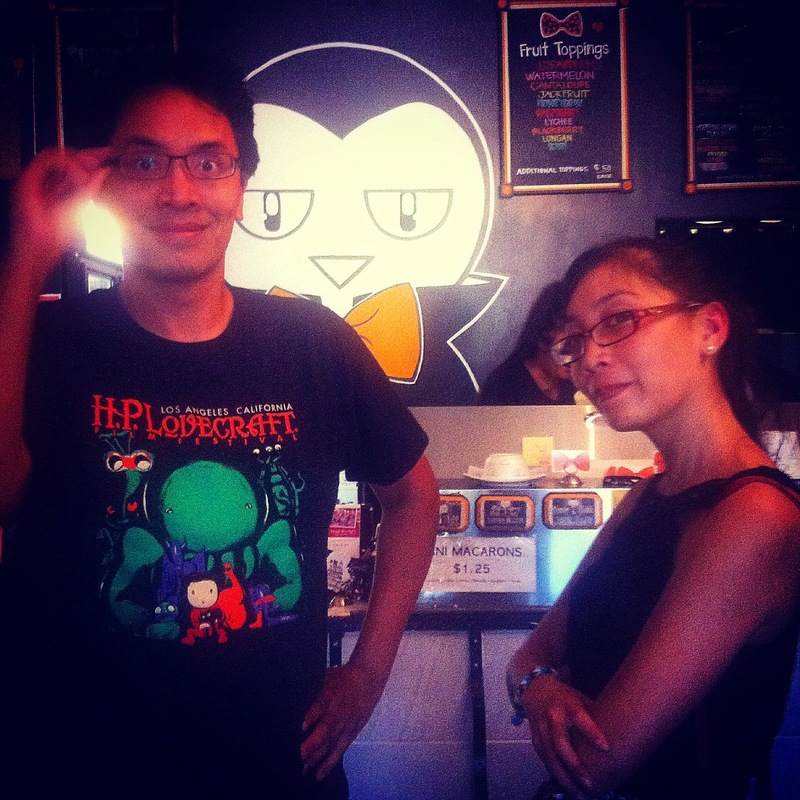 The author and Oscar-nominated Lao horror film director Mattie Do. I certainly believe there are times we must work against tokenism, essentialism, exoticism, misogyny, and “othering.” But one of the more unexpected partnerships that allowed Lao American arts to flourish was support from Minnesota’s science-fiction and fantasy communities. Without rehashing our complicated backstory, after the end of the Secret War for Laos in 1975, arts programming for Southeast Asian refugees wasn’t really a priority strategy. Rather than produce artists, we were supposed to pursue practical fields. Minnesotans wanted to keep Southeast Asians out of gangs and reduce early teen pregnancy and high dropout rates. For decades, nearly 80 percent of Lao, Hmong, and Cambodians were unable to finish college. Although our community was holding small-scale readings in schools and coffee houses in the early 2000s, it was a sluggard pace. There were certainly some fine successes, predictable stories firmly in the “pull yourself up by your bootstraps” model of American immigration many of us love—but our side stories are just as fun. 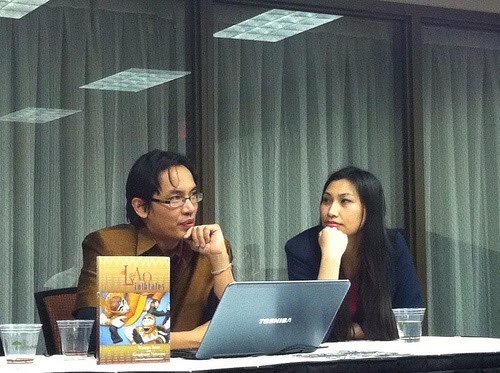 The author and Lao horror playwright Saymoukda Duangphouxay Vongsay discuss zombies, ghosts, and other myths at MarsCon in 2013. Conventions like CONvergence, Diversicon, MarsCon, and Arcana proved to be welcoming spaces, actively inviting emerging writers like myself to panels. Before you knew it, we convened presentations like Giant Lizard Theater, discussed the Zaj of Phalen Lake, Hmong vampires at St. Paul-funeral homes, or questioned what would happen if Godzilla and Cthulhu rumbled in Laos. What might a Lao space program look like, or how do you stop a Lao-bot rampage? Geeks in Minnesota were supporting community-driven knowledge exchanges, connecting emerging Laotian and Hmong artists to open-minded scholars, librarians, veterans, publishers, writers, computer experts, historians, scientists, traditional and experimental storytellers, folklorists, musicians, textile artists, illustrators, and community builders. Geeks actively encouraged Lao to participate in a setting unrelated to work, academics, or politics—allowing more casual but rigorous dialogues to advance our shared understanding of one another in an organic social lab. Some artists took up these offers more regularly than others, certainly, but the end result was a vital expansion of possibility. Based on conversations with our communities in California, Texas, Washington, and Wisconsin, for years this wasn’t as actively pursued in other states with large Southeast Asian-refugee populations. Lao American artist Nor Sanavongsay provided convention art for several Diversicons in a row. In the aftermath of the wars, there is a period of uncertainty and outright mistrust, and worries about reputation and relationships making refugees apprehensive. No one necessarily wants to speak up or out of place, or to put things on the record out of risk for themselves, their families, or their community. Because of the nature of the Secret War for Laos, much of our heritage is filled with blank spaces and redactions. What are young refugees to do in such a scenario? Discussing how things might have gone and considering alternate histories that differ from official narratives isn’t something we can typically do in formal spaces such as schools, temples, or work. Participating in science-fiction and fantasy conventions built comfort with one another, with public speaking, and with sharing without fear of reprisals or being sent to re-education camps. We had incentive to research, innovate, express, and imagine. There’s certainly more to be done and much to consider, but we’ve lain down the roots for amazing work in the decades ahead. As Minnesota welcomes refugees from Somalia, Burma, Bhutan, Syria, and other traditions, I hope many of those opportunities remain in place, and our community builders work together to ensure space for these exciting conversations. Bryan is the president of the Science Fiction Poetry Association and a professional member of the Horror Writers Association. An award-winning author, he focuses on Southeast Asian American speculative poetry, horror, and fantasy. Great work, Bryan! Looking forwards to the opportunity to work with you again!